Adachi-ga Hara, directed by Nao Sakaguchi. 25 minutes. November 16, 1991. 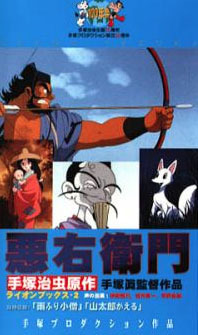 Akuemon, directed by Makoto Tezuka. 25 minutes. July 16, 1993. For the last two weeks I gave you OAV presentations of two classic manga masters, Monkey Punch and Go Nagai. Now here is Osamu Tezuka. In addition to his famous manga novels and his animation work, Tezuka created dozens of stand-alone manga short stories over forty years. Tezuka himself animated some of these as OAVs in the 1980s. 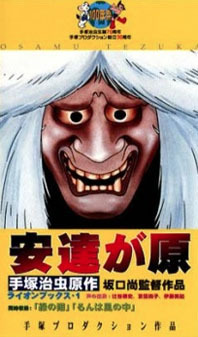 After his death in 1989, Tezuka Productions animated two more as 25-minute international film festival theatrical releases; Adachi-ga Hara, based on a 1971 manga, and Akuemon. Tezuka’s adaptations of his own manga into animation were often changed considerably. His Baghi, the Monster of Mighty Nature 1984 animated TV movie was an almost completely different story from his 1975 manga. (For one thing, the manga Baghi is definitely male.) It’s interesting to speculate on how Tezuka might have changed Adachi-ga Hara if he had animated it himself, instead of his studio doing it faithfully as a tribute to him. In fact, technically it shouldn’t be considered an OAV since it was shown theatrically before it was released on home video. Tezuka’s manga was a loose s-f adaptation of the original classic Noh play, written & performed by the actor/playwright Motokiyo Zeami (1363-1443), the creator of Noh theater. Zeami’s Adachi-ga Hara is extremely stately, about a group of wandering Buddhist monks who come to the hut at Adachi-ga Hara (the foothills of Mt. Adachi) of an old woman who turns out to be a cannibalistic ogre, the Onibaba. 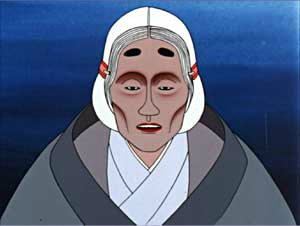 The ogre mask from Adachi-ga Hara has been used for centuries as a symbol for all Noh dramas. The OAV has a five-minute prologue spliced on that extolls all of Tezuka’s works. The story begins with a reprise of Zeami’s Noh play. It turns out to be the dream of a spaceman approaching a planet that’s said to be the home of a witch who lures space travelers there to kill and eat them. His assignment is to find and kill the witch. He immediately meets an old woman. The old woman is obviously the witch, so what else does the OAV have to say? The OAV is a long two-person confrontation, with a flashback beginning about halfway through that introduces more characters and changes how you may think this will end. There’s not much more that I can say that won’t be a spoiler. Adachi-ga Hara and Akuemon have been released together on DVD, but not in America. Here is both the anime OAV and Zeami’s live-action Noh drama for comparison. The stately Noh play is twice as long. Since this profile of Adachi-ga Hara alone makes a very short column, here is Akuemon also. 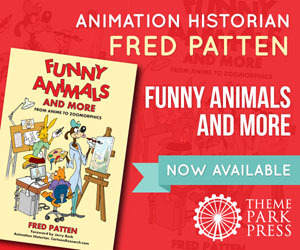 Unfortunately, the full online copies of it have been taken down; here’s a partial clip. 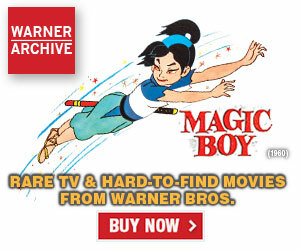 It was shown at a 1993 Hong Kong Film Festival before it was released on home video. It was directed by Osamu Tezuka’s son Makoto, adapted from Osamu Tezuka’s 1973 manga. Akuemon is set in feudal Japan. Lord Taisho Hidari, a power-seeking Daimyo (translated as Governor), wants to become the master of Japan. A fortuneteller tells him that he must hunt down a thousand foxes first. The arrogant Hidari assumes that he does not have to kill them personally, so he orders Akuemon, a violent peasant who hates and is hated by everyone, to kill the foxes for him. Akuemon is so successful that the foxes, who are shapeshifters, send Rizu, a young vixen whose mother Akuemon has killed, to turn herself into Kuzunoha, a young human woman, and save the foxes. She frees a young samurai, Abe no Yasuna, from prison and asks him to stop Akuemon from killing foxes. He promises to try to help, but only after he returns to his own province. Rizu then impersonates Akuemon’s wife, who has recently had a baby son, to live with Akuemon and warn the foxes when he is going hunting. She switches back & forth from a human mother to a fox to play with the baby. She and Akuemon gradually come to genuinely love each other, and she gentles him to give up his fox hunting. Fred, any possibility of looking at the Mad Bull 34 OAVs in your Forgotten Anime series… please?